The Tatra T77 was the first production streamlined automobile, providing spacious and comfortable high speed transport at a time when good roads were just being developed. 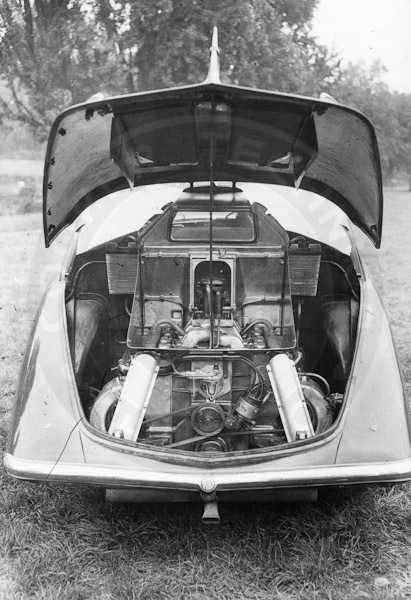 Tatra chief engineer Hans Ledwinka supervised the development of the T77, with his innovative central tubular chassis incorporating fully independent suspension, and a 3.0 liter air-cooled V8 engine mounted in the rear. The T77 created a sensation when it was first shown at the Paris Salon in 1934 due to its radical design, efficiency, unusual use of new materials and innovative engineering. The body shape, based on ideas from the early aerodynamics engineer, Zeppelin designer Paul Jaray, was the first to be shaped in a wind tunnel to reduce drag. Ledwinka's son Erich with engineer Erich Übelacker completed the design and production engineering. The T77 features a rear fin, then thought to provide stability at its 100 mph top speed. Ferdinand Porsche was a colleague of Ledwinka's and the Tatra strongly influenced the design of the VW Beetle and Porsche cars. 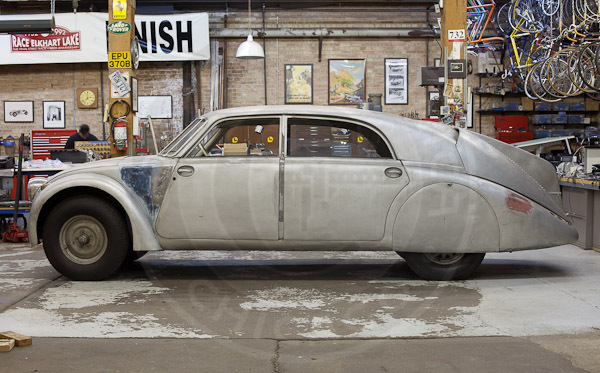 The car we are restoring was the sixth car built after series production began in mid-1934. It is the second oldest surviving example. 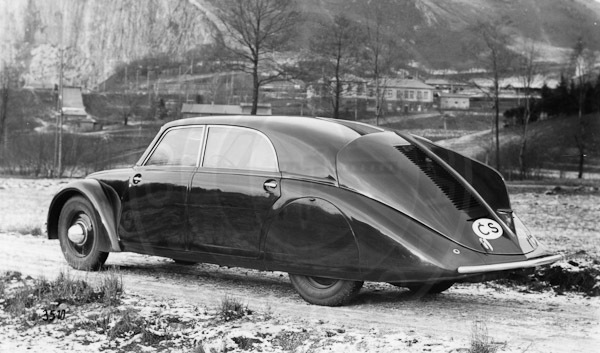 The Tatra's first owner was Jaromir Graf Czernin von und zu Chudenitz und Morzin, of Hohenelbe (now Vrchlabi), one of the oldest and most important families of Czechoslovakia. 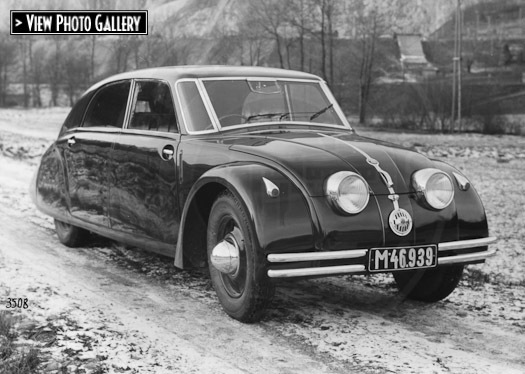 1934 Tatra T77, in an original factory publicity photo. Three-quarter rear view of Tatra T77, in an original factory photo. Engine bay. The engine is an air-cooled 3.0 liter 8 cylinder. Cooling fans force air up past the cylinder wall fins and out the back vents. 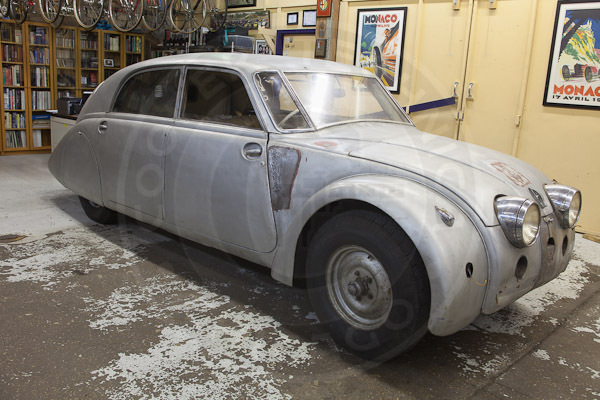 Side view of the Tatra T77 at Cooper Technica prior to restoration. Note: original blue color revealed as we strip the silver paint. The Tatra T77 at Cooper Technica prior to restoration. Note: location of trafficator where the paint was stripped.